The Hopi Reservation is located in northeastern Arizona. The Hopi Reservation is completely surrounded by the Navajo Reservation. Within the Hopi Reservation are three Mesas which contain Hopi Villages: First Mesa (Walpi, Hano and Sichomoivi), Second Mesa (Shongopavi, Mishongnovi,Shipaulovi, and Third Mesa, (Hotevilla, Bacavi, Moencopi, Kykotsmovi and Oraibi. Hopi Indian Basket weavers gather plant materials, using the natural background to contrast with their vivid designs typically in red, yellow, and black. Hopi Native American basket makers use three basic techniques: plating(cradle boards and Piki trays), wicker(Third Mesa)and coiling (Second Mesa). 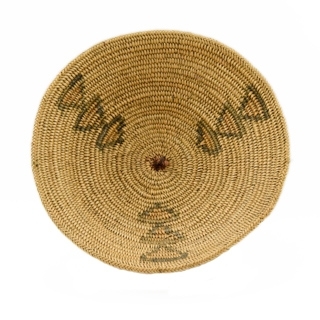 Hopi Indian baskets are made from rabbit brush, sumac, dune brush and yucca. Hopi Native American Baskets are symbolic of Hopi Life past and present, religion, dances, rainmaking, corn harvest and rites of passage.